With more than 20 student organizations, there is a place for everyone. Many groups work for social change through public forums, publish articles or sponsor and host well-known speakers. Others may donate their time for legal research for a group in need, solicit pro bono legal help, or raise funds for a specific cause. 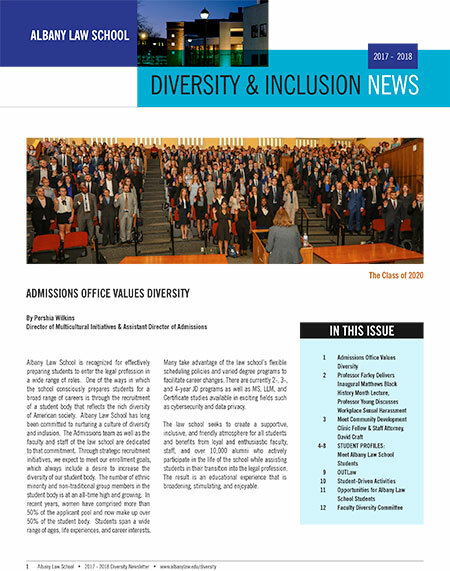 Albany Law School is committed to providing a supportive environment for its growing multicultural population that will allow for a greater understanding and valuing of differences while also embracing similarities to achieve a common mission.